Sometimes the smallest things can make life in the kitchen easier and more fun. Take for example the Nut Chopper by Progressive International. Chopping nuts isn’t a big deal, right? But here’s how I did it before they sent us a sample of their handy dandy Nut Chopper to try out: I took a bunch of nuts, placed them on a paper towel, covered them with more paper towel, and then beat them into submission with a mason jar. I never had a clear idea how much the nuts I chopped would measure. And the nuts were never evenly chopped — some were like dust, others still whole. So this Nut Chopper, simple though it is, is quite a revelation. 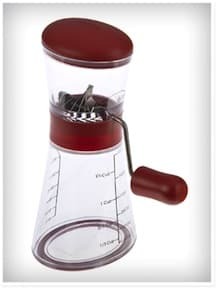 You simply put the nuts into the top section of the device, easily grind them up by turning a handle, and they fall into the base that’s marked for easy measuring. The top comes off and you can toss the measured nuts into your recipe. Or, if you’re serving a casual meal at home and want to pass chopped nuts around the table for topping foods like pasta dishes or stir-fries, simply leave them in the base and pass them around. I’ve tried several varieties of nuts with this chopper and they all work equally well. If you like using nuts as much as I do, you’ll find this reasonable priced tool quite useful! * for storage and cooking on Amazon.com.